The Swedish Social Democrats (the ruling party) have been in power for almost 80 of the last 100 years. They are not, however, very keen on talking about their past when it comes to the politics of racism. It was at the initiative of leading Social Democrats that the first ever state-run Institute for Race Biology was established in 1922. Within the workers’ movements, it was ingrained that Swedish workers were superior to other races. Even within the intellectual elite of the “Socialist” movement too it was “common wisdom” that Swedish culture and values were superior. It was this institute and their “scientific” work which was to prove the inspiration for the German version of eugenics. Whereas the German Institute was shut down after the war the Swedish Institute continued and later became part of Uppsala University and its genetics centre. In 1918, it was suggested that an institute of racial biology be partially funded by the Nobel Committee (Lundborg, 1922). This was unanimously supported by the Nobel Committee itself, but the idea was seen as a misuse of Nobel funds and a race-biology institute was not created at that time. 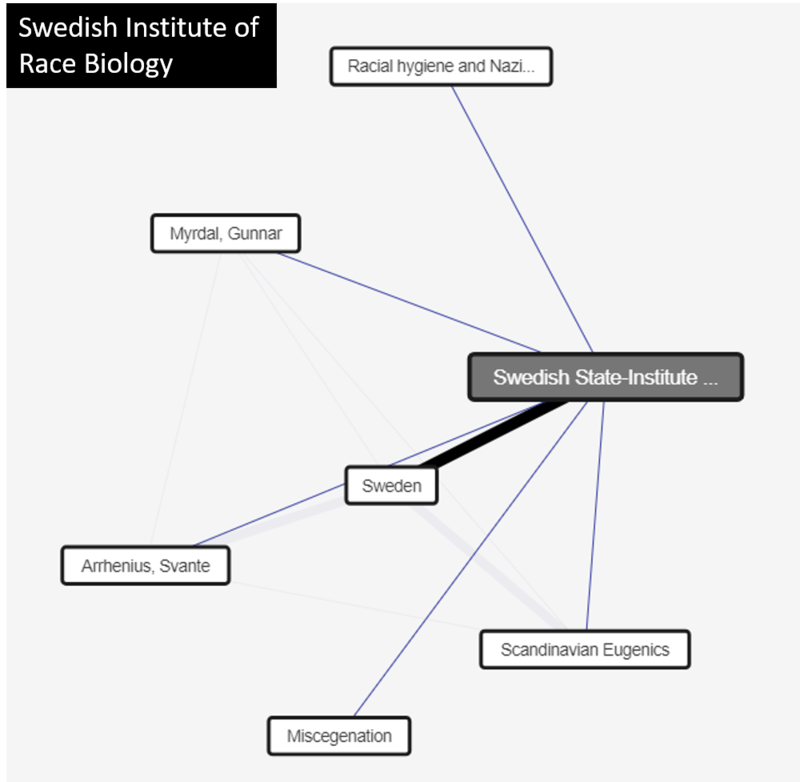 Lundborg argued that a race-biology institute was important to prevent racial degeneration in Sweden, and ultimately, the Swedish state-institute for race biology was created (Lundborg, 1922). …. …… The purpose of the institute was to research genetics, heredity, and racial characteristics. (Lundborg, 1922; Broberg & Roll-Hansen, 2005). The data from this research was meant to be used to create practices that would supposedly improve the quality of the Swedish population (Lundborg, 1922). As eugenics became less popular in the public, the institute became controversial and was eventually renamed in 1958 (Broberg & Roll-Hansen, 2005). Through their own eugenics program, where the Sami people were subjected, until as late as the 1970s, to forced sterilisations and abortions, the Swedish program was not so very far removed in its objectives from the Nazi program. The Nazi methods and the scale of their program were of a quite different magnitude. The Social Democrats would rather that this part of their history went away quietly. They have never really confronted the past or come to terms with it. Many leading Social Democrats (among them the Myrdals) were strongly involved in the vision of eugenically ensuring a population with the “right social attitudes”. In the mid-1970s Sweden’s parliament abolished the eugenics-inspired sterilization legislation enacted in 1935 by a social democratic government. During the four decades that passed between implementation and abolition, almost 63,000 Swedes were rendered infertile, in many cases in response to pressure from the state and sometimes as a result of outright compulsion. Furthermore, it was chiefly those regarded as ‘‘unproductive’’ who were the targets of that social policy. The Sweden Democrats is the anti-immigration party which has seen increasing popular support over the last decade. Inevitably it is attacked for having its origins with, and having connections to, neo-Nazi (rather than Nazi) groups in their past. Other political parties have shunned them and have refused to contemplate working with them in any way. In this September’s general elections it is very likely that the Sweden Democrats will end up as the second largest party in parliament. The game is changing. Yesterday I found it a case of very high irony indeed when the Sweden Democrats released a 1h 45 minute documentary about the place of race in the Social Democrats’ past. They use racism – which they are usually accused of – to attack the Social Democrats. Pure propaganda of course but not factually incorrect. The Social Democrats are trying to shrug this off as propaganda but they have some very dark skeletons in their closet. The Social Democrats with their eugenics program were probably as close, if not closer, to the Nazi eugenics of the 1930s and 40s, than the Sweden Democrats when they began, were to the neo-Nazis of their time.